The snow may be melted, but that only means another prime season in one of the best mountain towns the state of Colorado has to offer. Telluride- phenomenal in the winter and just as enjoyable in the summer. 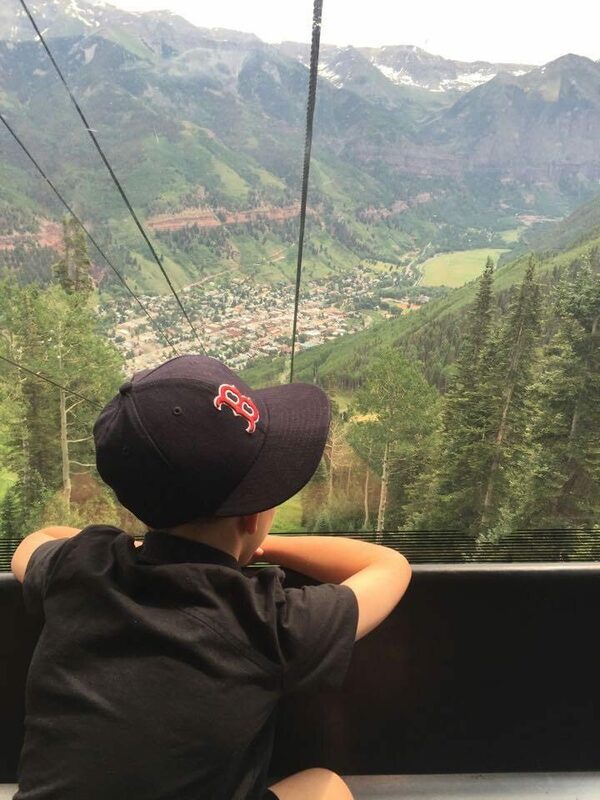 Our family has been vacationing in Telluride, Colorado a minimum of 1-2 times a year, for the last 16 years. My in-laws introduced me to this mountain paradise when I first started dating their son back in 1999. On a drive from Las Vegas to Denver to take my brother-in-law back to school at the University of Denver, they made a pit stop in a little mountain town they knew nothing about. They fell in love, invested in a property, and the rest is history. Their vision of spending snowy holidays and sunny summer days in their log cabin style home became a reality for us as our family started to grow. My children have been traveling to this mountain top town nestled in the San Juan mountain range at 10,000ft since they were born. My husband and I could never thank our in-laws enough for providing us the opportunity to get to share and make these memories with our kids throughout their childhood. Here are some of the reasons we love it, and what you should know before heading to this tucked-away town in the box canyons. Telluride– you are in the midst of all the energy and action. Food, shopping, activities are all walking distance away. A car is not necessary, rent or bring or bike instead. If you are in town during one of Telluride’s more popular festivals, just know that the town will be busy and there will be people everywhere and parking is limited. Wherever you stay, make sure it comes with a guaranteed parking spot because parking can be tricky and frustrating. Nightlife is present with cool bars and locals. A huge farmer’s market takes over several streets in the summer offering everything from veggies, fruits, meats and breads to arts and crafts and handmade clothing. Mountain Village– is based on a European ski village. Still lots to do, but not quite as busy as town can get. Food and shopping not as abundant, but there are decent options. Lots of activities set up for families and kids like Kids’ Nights, Movie Nights, Live Music, but not much of a night life after 9 or 10pm. There are two major hotels in Mountain Village, the Hotel Madeline and The Peaks Resort and Spa– both recognized for their luxury and well-appointed rooms and hotel amenities. Beyond that, I would recommend renting a VRBO, especially if traveling with multiple families, or if your family just happens to be big like mine. What I love about staying in a VRBO in Mountain Village is the convenience of it all. With lots of kids we can eat all of our meals at home if want, and we can bring less clothes and with a washer/dryer option. 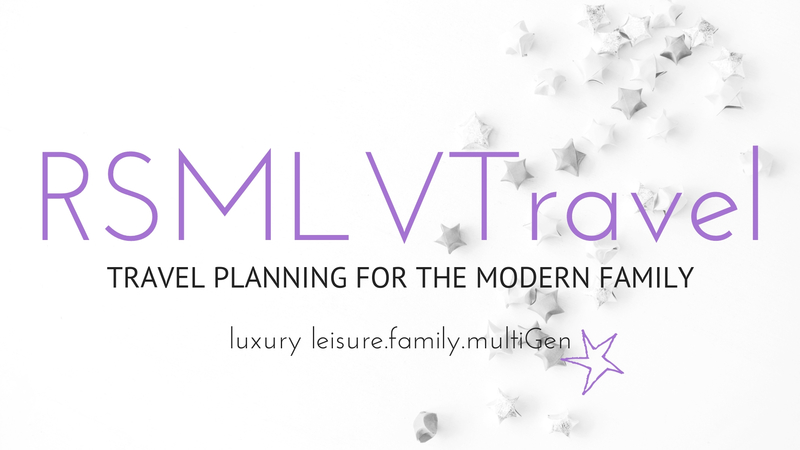 We can keep the kids entertained with board games, nature hikes, yard games, snowball fights, snow forts, hot tub and hot cocoa memories while my husband and our friends can relax on the deck with a cocktail, music and conversation warmed by the fireplace. What is tricky about staying in a VRBO in Mountain Village is the idea that we are being budget friendly with our groceries and meals, but it’s hard to say. Groceries in Telluride can be and are very expensive. Think Whole Foods on major steroids, and they don’t always have the organic options to back up the cost. Shopping at the local grocer almost makes you wish you were paying Whole Foods prices. Groceries can also be sparse depending on the time of year. It all makes sense when you think about it- not easy to get fresh produce and meats delivered on a regular basis at 10,000 feet above sea level, and when it is delivered, it costs money. Since we usually drive to Telluride, we make Costco run for things like orange juice, meats, produce and alcohol, then buy the fillers when we get there. This time around we had Hello Fresh (meal delivery service) deliver us three complete meals to cook at home. This saved us cargo space and money and was super easy. Let’s start by getting TO town. Depending on where you are coming from is really going to dictate your mode of transportation. We live in Las Vegas. We usually drive. It is a 10-12 hour drive for us, depending on how many times our kids make us stop. Like I said, they have been road tripping T-Ride since they were babies, and all 4 of them do remarkably well. Since there is such an extreme change in elevation, we plan on overnighting on our way there to begin adjusting. 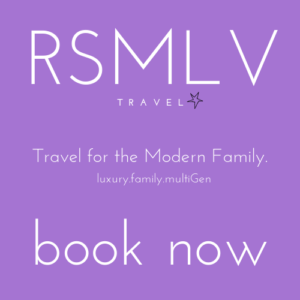 We love to stay in Moab, Utah but since the town has started to grow in popularity for mountain bikers, rock climber and just the general outdoor enthusiast, the hotel room rates can be kind of obscene. Also, the drive into Telluride from Moab can be a bit, shall we say, breathtaking? It is not for the novice driver- beautiful views but lots of switchbacks and high roads with a long way down. We started driving through Grand Junction, which is about a 2-hour addition to the drive, but a smoother drive and more affordable rates for motels like Courtyard by Marriott, Holiday Inns, and Comfort Inns. 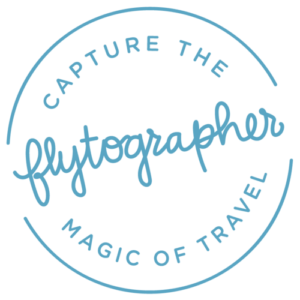 There is the option to fly, however, it can be pricey, and depending on the season, flights may be hard to come by. Telluride does have its own runway and airport, but is used anymore these days for private jets. The closest airports are Montrose with a 1-hour drive time into town, or Grand Junction with a 2-hour drive time into town. 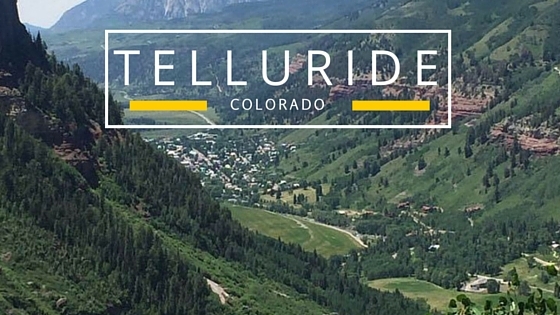 Because getting into Telluride is no easy feat, being there makes it all that more exclusive. Once there, you really don’t have to have a car to get back and forth and around town. There is an awesome service called Dial-a-Ride that will come and pick you up and drop you off for free. Yes, FREE. (As a courtesy, tip your driver.) You will also get to experience the only FREE gondola in the United States run mainly by solar power that will take you up and down the mountain, to and from Telluride to Mountain Village and back. So, you have that going for you. The gondola offers spectacular views of the San Juan mountains and valleys, showcasing the area for miles and miles. Definitely plan on a gondola ride at least once during your stay, though I bet you will take it more than you can count on two hands. The Butcher and Baker Cafe: Kind of sort of reminds me of Joan’s on Third in Santa Monica on a much smaller scale. A walk-up to order off either a daily menu written on a big chalk board sign, or from the deli case full of fresh made salads, fruit bowls, and pastries. You can purchase some of the signature items like bloody mary mix, and their to die for baked goods (get their first thing in the morning if you want cookies). 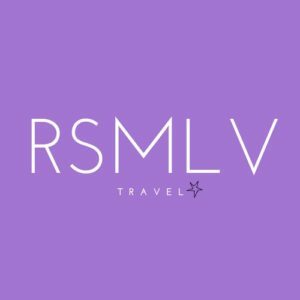 Kid’s options, handcrafted sodas, hand mixed lemonades, fresh ground coffee, cocktails and a wine list…need I say more? Rustico: Consistently delicious Italian meals and pizza served by attentive and friendly staff and occasionally the owners will make the rounds to say hi and thank you for joining them. Try for the Alfresco dining in the summer months, and sit fireside inside during the winter. Incredible bar and great drinks. They have a sister property in Mountain Village called La Pizzeria, equally delicious and a little more casual. Outside dining also available, which I highly recommend during summer when festivals and live music happening on the green. Allred’s: The only way to get into Allred’s is via the gondola, where you will get off at San Sophia Station. 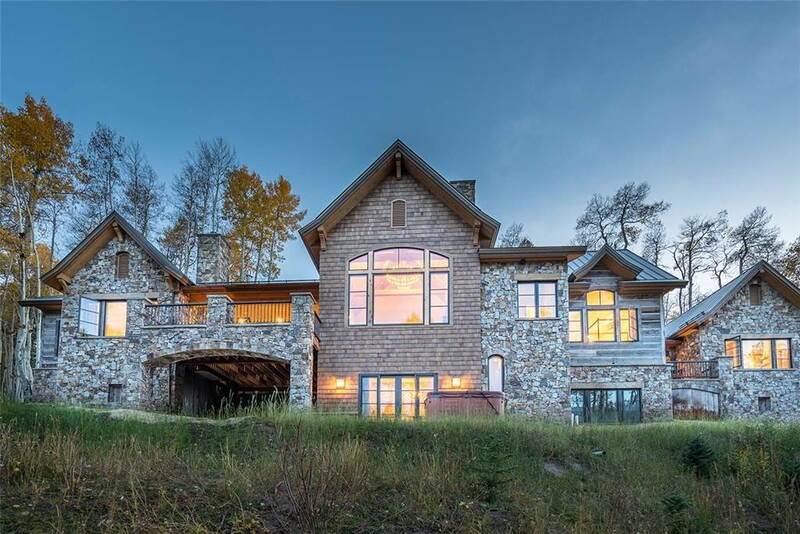 Do this for a classy dinner, apres ski drinks, or just for a cocktail to admire the view from their all-window wall that looks out onto the town of Telluride below. Allred’s is the restaurant for the ski and golf country club in Telluride, so it is only open to the public for Apres, Dinner or Cocktails after 5pm. The menu is always current with seasonal selections. And, there is a children’s menu! Brown Dogs Pizza: Believe it or not, there are award winning pizzas on their menu! A hole in the wall situated right on Colorado Street, Brown Dogs is a totally kick it kind of locals sports bar with delicious grub like pizza and wings and an array of the latest in local brews. Don’t ask for anything mainstream on tap, they will laugh you right out of the place. Kids love it because they can make their own pizza! 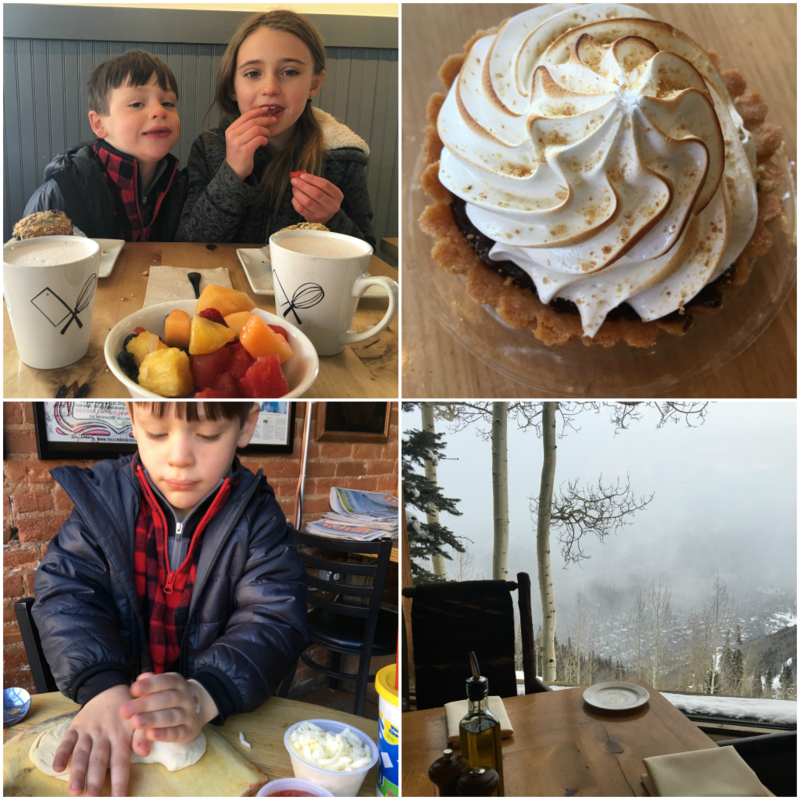 If you haven’t noticed yet from my story, Telluride is a very family friendly town. There is not much you cannot do without your kids. 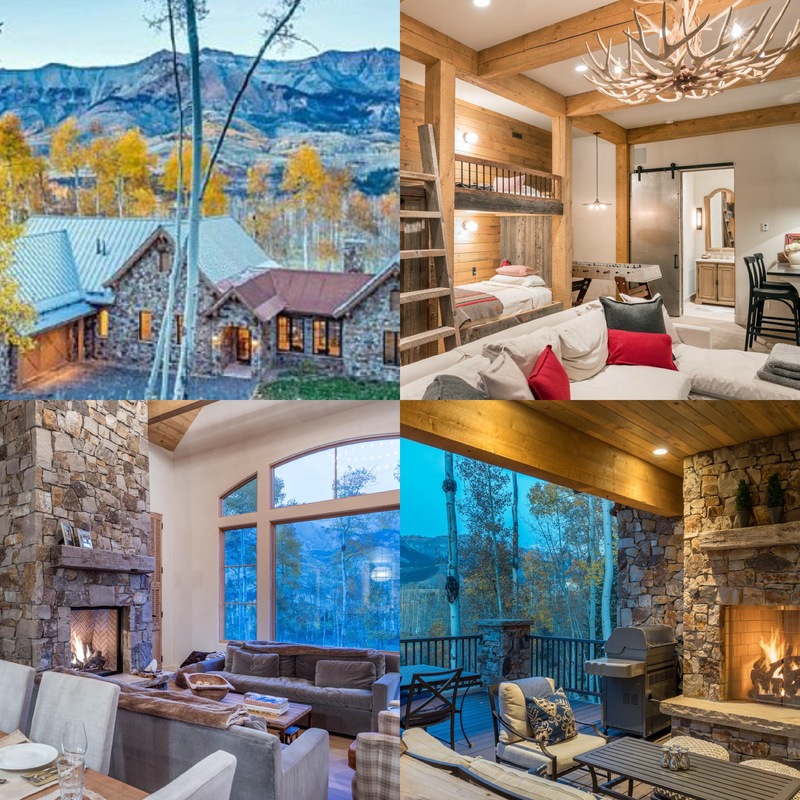 Of course, you can also do ALL of this without your kids, but if you are coming strictly to spend time with your family, then Telluride is certainly the place to be. Our favorites combine both action and relax time for both kids and parents. Wilkinson Public Library: Offering both a children’s section and a teen section, there’s plenty to do here without sticking an iPad in your kids’ hand because you need a 10-minute refresh. Teen room offers latest and greatest in tech games and board games. They can also indulge in some music and group activities to keep them social and protect their reputation. The children’s library is a total unicorn- hands on toys and games for the kiddos, tech games, computer time, full of books and movies, story times, crafts and activities, a carved wooden story chair and indoor treehouse. Telluride Historical Museum: This tiny mountain town was once a big part of the mining industry in the 1800’s, and the Telluride Historical Museum was established to tell the story. The museum is housed in a building built in 1896 that functioned as the medical facility and hospital of the time- Hall’s Hospital. Take a tour though the recreated rooms, observing artificats showcasing the way of life and the people who put Telluride on the map. It is well worth the visit. It is also associated with The Smithsonian Institute, proving the museum is well done. A nice historical and educational way to spend your time, and end your visit with my kids’ favorite thing to do…pan for gold! Or other rocks and minerals and gems found in the mountain range surrounding Telluride. Mountain Village: Depending on the season, Mountain Village is a lively little ski village in the winter and bustling little mountain village in the summer. Kids’ activities are abundant around here- activities will be set up on the grand lawn (or in the convention area of it’s winter), concerts, outdoor movies, bungee trampolines and obstacle courses. There are food carts with yummies like Diggity Dawgs Hot Dogs, Crepes and the Grilled Cheese lady. And, there is a Dylan’s Candy Shop for special treats. 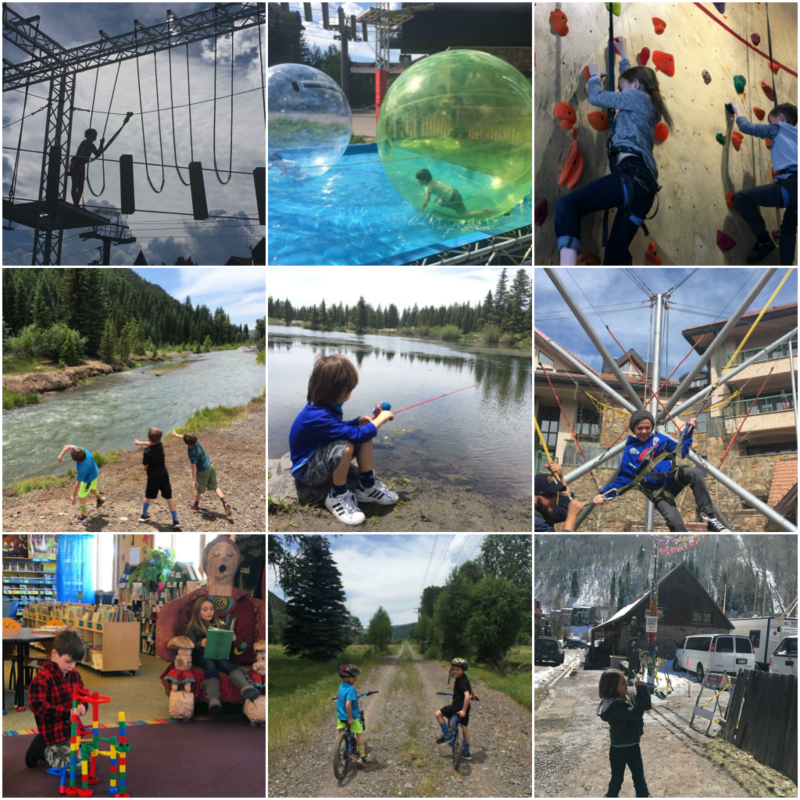 Telluride Gravity Works: Indoor Rock Climbing with Belay option for the bigger kids provides at least an hour of fun for everyone. A smaller beginners wall for the little ones and taller, more challenging walls with belaying for the more experienced or for those who want to learn. Staff has always been professional, friendly and helpful, and our kids ask to go every time. 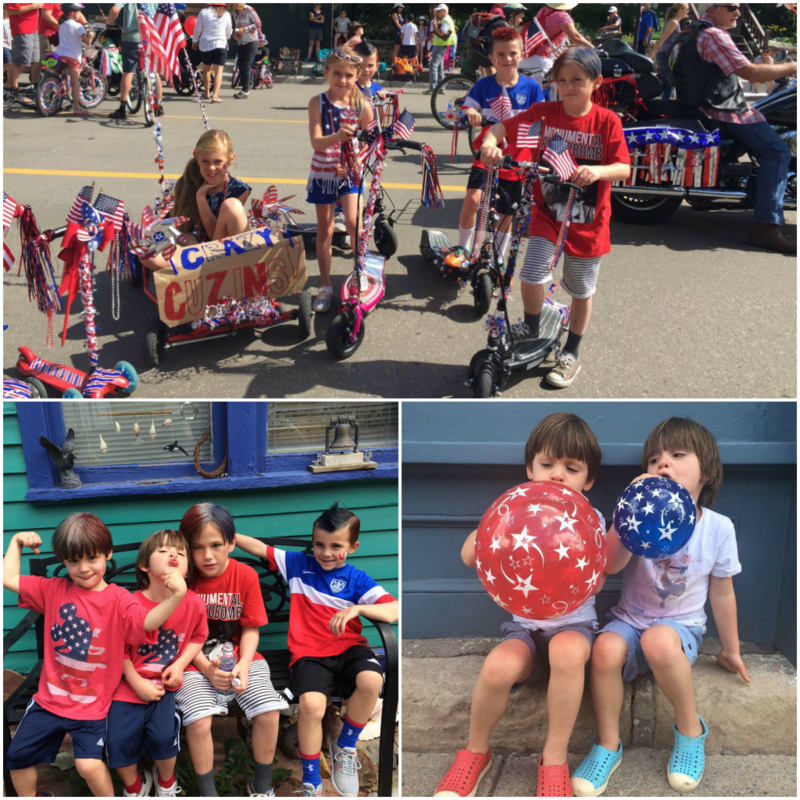 With 4th of July right around the corner, the town of Telluride gets lively and patriotic with a town parade down Colorado Street, community BBQ at the park and fireworks to top off the night. It’s one of our family’s most favorite times of year!